Foundations and landscaping, including grass, shrubs and trees, may be watered for up to 2 hours any day by a hand-held hose or soaker hose. Low-flow drip irrigation systems may operate as needed. A variance may be requested to water new landscapes for up to 30 days. Instructions are available at plano.gov/variances. 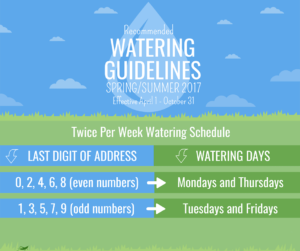 Variances are not required for filling pools.